Al Khalij Commercial Bank (al khaliji) QSC has provided financing for the two Nakilat shipyard joint ventures: Nakilat-Keppel Offshore & Marine (N-KOM) and Nakilat Damen Shipyards Qatar (NDSQ) for US $120m and US $40m respectively. Nakilat is a Qatari marine transport company providing the essential transportation link in the State of Qatar’s LNG supply chain. The company says its LNG shipping fleet is the largest in the world, comprising 56 LNG vessels. Nakilat also manages and operates four large LPG carriers. Via two strategic joint ventures, N-KOM and NDSQ, Nakilat operates the ship repair and construction facilities at Erhama Bin Jaber Al Jalahma Shipyard. N-KOM is a joint venture between the State of Qatar’s premier gas shipper Nakilat and leading offshore rig constructor and ship repairer Keppel Offshore & Marine Ltd (Keppel O&M) and was established in 2007. 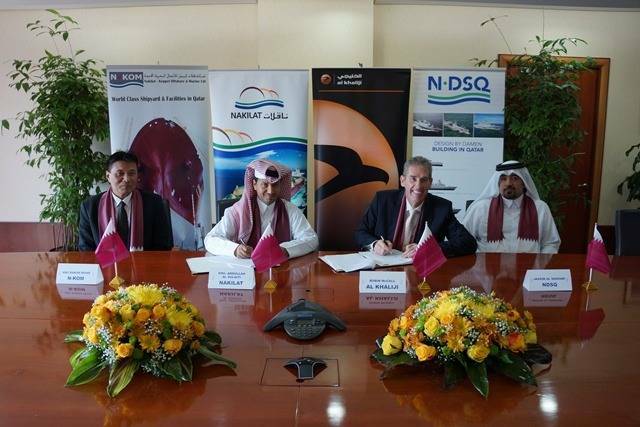 NDSQ is a joint venture between Nakilat and Dutch shipbuilder Damen and is based at Erhama Bin Jaber Al Jalahma Shipyard in Ras Laffan, State of Qatar. Upon the occasion of the signing, Managing Director of Nakilat and Chairman of N-KOM and NDSQ Eng. Abdullah Fadhalah Al Sulaiti said: “This agreement is a clear demonstration of the strength of our businesses at Erhama Bin Jaber Al Jalahma Shipyard. N-KOM’s and NDSQ’s track records are testament to the success of the Emiri vision for a world-class marine industry within the State of Qatar. To date over 200 projects have been completed at Erhama Bin Jaber Al Jalahma Shipyard since its inauguration in 2010."